A detailed Railway Map of India showing the Railway Network in India. 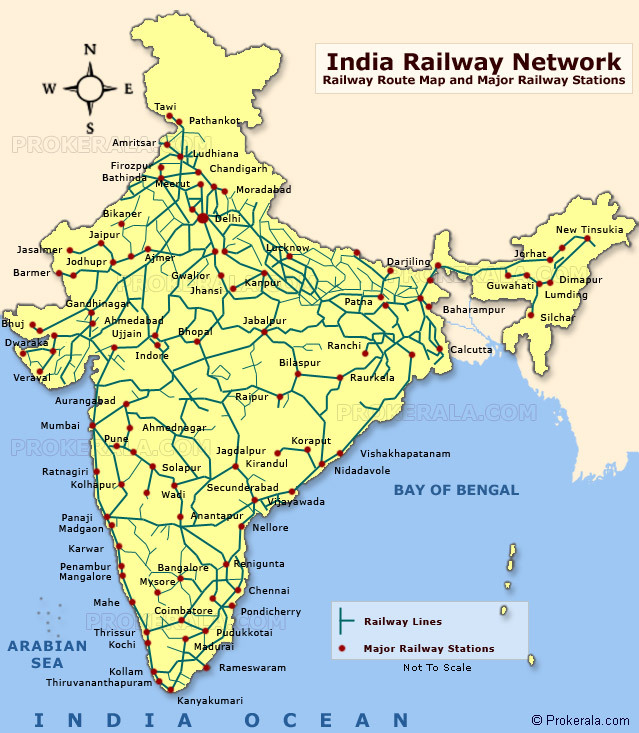 Locate railway stations and rail routes in India with the help of this India Railway Map. This rail map shows the railway network in each and every indian state and also the location of major railway stations India. This indian railways map will be a useful guide while traveling in India by train. This map can also come in handy if you're planning a trip to India which involves train travel. This is a free printable map which is also free to download. The India Railway Map given above is useful if your looking for information on Indian Railways (IR) or Indian Railway network or railway stations in India. Here are some additional useful information about the railway system in India. Some basic information about the Indian Railways. The Indian Railway network covers 28 states, 3 union territories and some areas of Nepal, Bangladesh and Pakistan. The total length of railway line in India is around 63,320 kilometres. There are a total of 6,909 railway stations in India. The Railway Map of India shows the rail routes in India along with all the major Railway Stations. The Indian railways also play a lead role in promoting tourism in India. For this purpose, there are several luxury trains that cover various important tourist destinations across the country. Detailed informative printable India Railway Map for free download.